Over the years, the real estate industry has stayed comparatively concealed from many of the technology interference that has altered other industries. In a decade that has so far observed the effects of the IoT services, artificial intelligence, virtual reality, and machine learning, players in this industry still rely on their smartphones and fundamental internet-based tools to carry out their business functions. 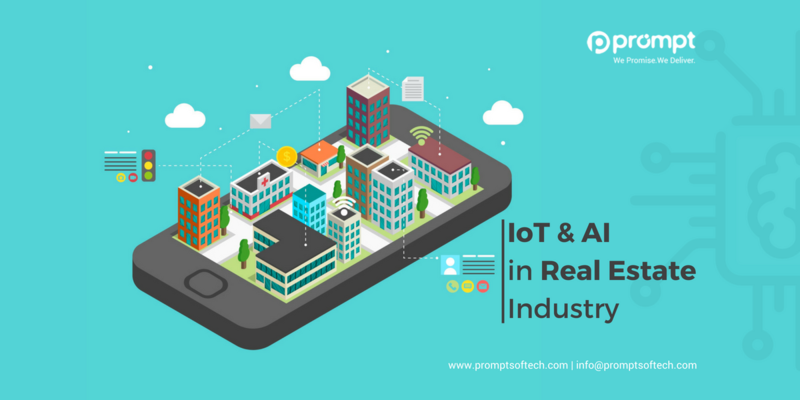 The Internet of Things (IoT) and Artificial Intelligence (AI) are gradually enabling impressive progressions in building competence to Real Estate industry. They are creating innovative revenue generation opportunities for this industry globally especially in the year 2018. With artificial intelligence and IoT app development companies empower these creative transformations. Visualize a home that sends you a text message when your fridge is out of milk. Imagine your go-to playlist music streaming on your music system automatedly. Imagine buying a property or home in a particular location and being able to look at the location surroundings, have updated price trends and your payment plans for them on your smartphone. As real-estate starts to incorporate different technologies like IoT, AI, machine learning, chatbots and blockchain, the buying, selling and in point of fact living in homes assure to be more well-organized, safer and enhanced. IoT to an extent has fulfilled the desires of people to perform their daily tasks much easier by enabling better-automated solutions. For example, a smart IoT system at office or home will sense the temperature and automatically start or schedule the air conditioner before the residents enter the home. Similarly, an intelligent security system will notify the regular activities along with any irregularities in the house. When most people hear about “smarter buildings,” the only two essential innovations come into their minds that are motion sensors and smart thermostats. But smart building technology has advanced far ahead of these customer-friendly touch points. Modern-day buildings have thousands of sensors exploring vast quantities of data. This sudden increase of sensors has led to a boost in data collection and access that significant commercial real estate (CRE) companies resist or struggle to route and analyze. Every piece of building equipment has a sensor endlessly reporting status. While building management teams are trying to use these sensors to actively find maintenance requirements that are where its most usage comes to an end. So majorly the commercial real estate companies are not yet proficient in taking full advantage of overall utilization of resources and comprehending to definite cost management advantages. Also, data without analytics or insights is basically, just a jumble of numbers. Property management is one of the standard challenges for property management teams. Property executives and managers are often tasked with the accountability of searching tenants and keeping units engaged, keeping them pleased, maintaining infrastructure and machinery, shortlisting vendors, and working in link amid the tenants and landlords. For big buildings and commercial properties, this is often an off-putting task for their staff, wherein artificial intelligence shows its prime benefits by enabling smarter business processes. New companies in the market are aiming to decrease the tiresome efforts and time-consuming activities in which buyers, sellers, and brokers are involved. Instead of physically shortlisting homes, you can build a virtual wishlist of preferred homes with criteria say your budget or desired nearest location. It’s now likely to liquidate the overall assets on a real-time basis. It can streamline the living style and make it cost-effective. The use of water and electricity can be controlled in the capacity as well as charges. Your entire home like the fans, water heater, and even a running tap can be controlled by pressing keys on a configured smartphone. With an application, you can also check how your real-estate assets throughout the country are performing. Other technologies like a chatbot can answer approximately 700 queries at the same time for multiple projects, and instantaneously, it is not feasible for a human being to do that. Like the majority of other industries and businesses, big data is playing an enabler role in the overall real-estate business, markets, and industry. When the customer and industry data access is provided to real estate companies, they can use AI algorithms to enhance the facets of their business. The things that can be improved comprises of targeted marketing and sales, appraisals, accounting, and finance, which are increasingly becoming complicated to carry out due to the high number of surfacing factors that keep on moving the price of properties. There are quite a few companies in the market like Zillow, which offers tons of real estate data that customers can utilize while making buying and renting decisions. There are even other such listing platforms that are gradually transforming the real estate industry in regards to AI-powered data analytics; however, a lot more work is demanded before they can turn to be the just right AI-powered platforms to yield the real difference. How Much Does it Cost to Make an App like tinder? Search engines have always been an important tool for linking real estate agents with potential buyers. Even though a majority of this buyers search properties online, they eventually use an agent during the final purchase. To assist this situation and enhance the different user online experience search engines like Google and Bing are utilizing AI to help users in getting much more from a fundamental property search. Conventionally the real-estate stakeholders were often limited to a handful of search criteria such as the location or price, but now more criteria’s are used to improve the decision-making. Now, with AI, searches are more refined with more analytics and insights for precise properties like ROI, better neighborhoods, and other property that can be useful during the buying process. Some real estate companies are already using IoT and AI to bring changes in this domain. We still have a long way to go before IoT, and AI can become the dominant wave that has positively altered many of the other industries. In the current scenario, we can lie around in the hopes that IoT and AI will make the real-estate industry a much-improved place that will empower the stakeholders instead of replacing them.